Message – The Father provides the works…the Spirit equips the Church! 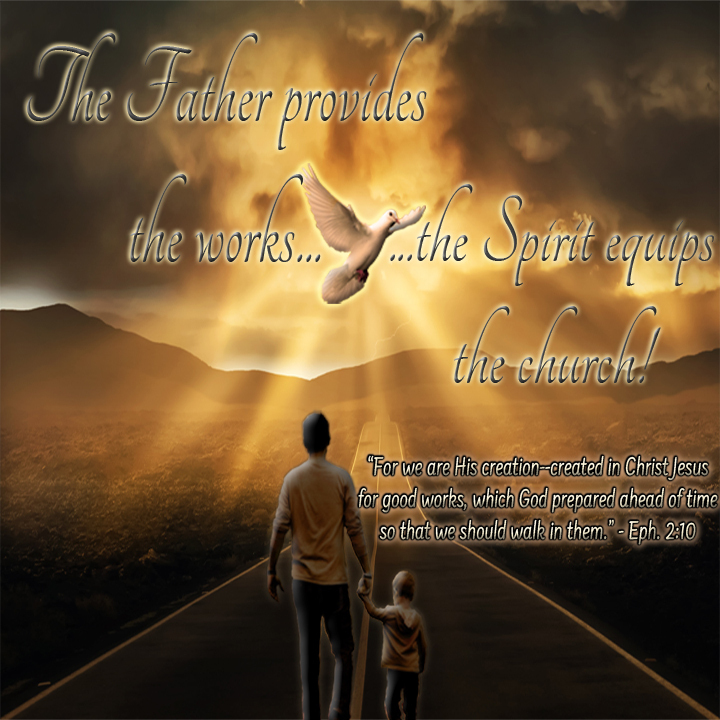 The Father provides the works…the Spirit equips the Church! 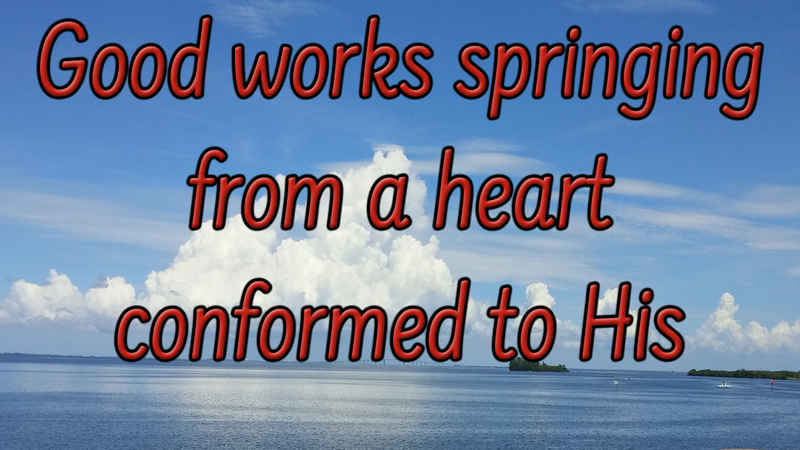 As we have been affirming – the primary work of the Kingdom…the work our Master/Nobleman & Lord has commissioned us with a stewardship to perform is – Good works springing from a heart conformed to His. Good works are something the Father has prepared before our birth – things which should shape How we live our lives. It is in fact the purpose behind our new birth! What is the role that hope plays in relation to our faith? How does the scriptures define faith? Faith is the concrete under the feet of our expectation. It lends inner and unseen assurance for things we have come to expect and anticipate. Let’s read a very familiar passage and examine it for a minute before continuing in our lessons on the salvation of our souls. Two primary statements I want us to focus in on here. 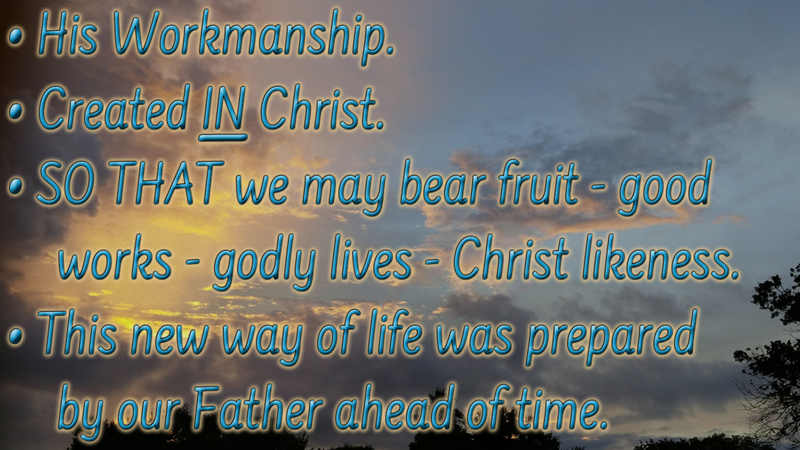 SO THAT we may bear fruit – good works – godly lives – Christ likeness. This new way of living was prepared ahead of time as something we should live in. In order for this to work we must trust in Christ AS He is revealed to us. Salvation of the soul is made effective by our trust in Him. Just like a life preserver can only save you if you trust into it. SO THAT we may be saved – good works – Christ likeness. So this just goes to add another brick in the structure we are building concerning the salvation of our souls. These verses alone offer us sufficient evidence that salvation (all salvation) is BY grace – through Faith and it’s objective is ‘Christ in us’? I keep telling you we are going to discuss suffering…and this week we are going to take a look at one or two more passages concerning the progressive work of our salvation which introduces the need for suffering…plus I will teach on it in more depth as we continue in these lessons. Turn if you will to Hebrews chapter 10. This is a chapter which has caused many to become defeated and discouraged through misunderstanding what it is saying. Let me be really clear here – we KNOW sin is terrible. We also know that Christians can actually LIVE in sin for a period of time and still be born again – as we see in 1st and 2nd Corinthians. We also have Paul testifying that after he came to Christ the things he hated he found himself habitually practicing. So this passage in Hebrews is NOT contradicting all we have read and learned before. It says WHAT it says in a context and then IMMEDIATELY qualifies it’s meaning. But you will see faith for soul salvation, suffering and Good works closely connected in these verses. This is suffering – our bodies a living sacrifice to God. Holy & well pleasing which is no more than our reasonable service and evidence of true worship. Willful sin here answers to the old testament “high handed” sin. It was not presumptuous but defiant. It was a shaking the fist at – it was an open and avoid reject of the law that says not to – as is seen in the following verse where the writer first offers an example immediately followed by a description. These are three very descriptive and horrible things – they go beyond egregious into the blackest and most defiant and violently ugly of treasons. Trampled the son of God underfoot – means to treat with the utmost contempt and indignity. It means more than to simply think it to be common and esteem it as being of no higher value than that of a sheep, goat or even a swine. As common – not special, not priceless as possessing no transcendent nor holy value at all. But it means to press on an consider it no just common but unconsecrated, unclean and defiled. To insult the Spirit of Grace – To treat with despite or reproach. To treat with contempt, an attitude of despising and malice. We will very likely look deeper into faith & sufferings and the role they play in the salvation of our souls next week.